PACIFIC OCEAN GYRES MAP - The surface of the planet is approximately 71% water in five oceans, including the Arctic, Atlantic, Indian, Pacific and Southern. For many years only four oceans were officially recognized, and then in the spring of 2000, the International Hydrographic Organization established the Southern Ocean by determining its limits. Those limits include all water below 60 degrees south, and some of it, like the Arctic Ocean, is frozen. The world ocean is the principal component of Earth's hydrosphere, it is integral to all known life, forms part of the carbon cycle, and influences climate and weather patterns. The world ocean is the habitat of 230,000 known species, but because much of it is unexplored, the number of species that exist is much larger, possibly over two million. The origin of Earth's oceans remains unknown; oceans are thought to have formed in the Hadean period and may have been the impetus for the emergence of life. 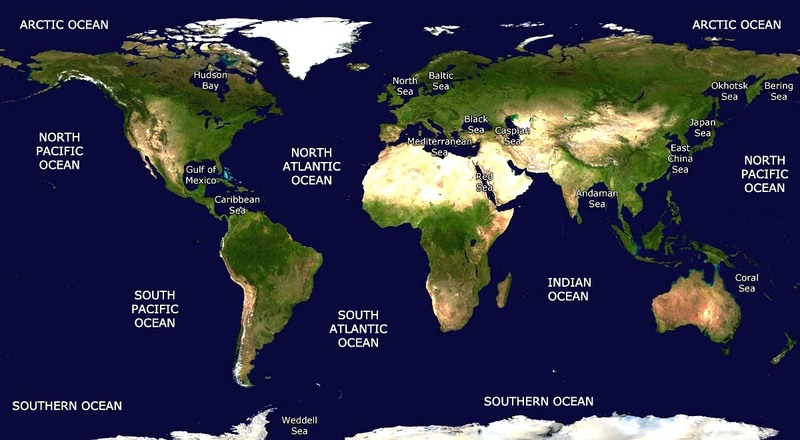 Though generally described as several separate oceans, these waters comprise one global, interconnected body of salt water sometimes referred to as the World Ocean or global ocean. This concept of a continuous body of water with relatively free interchange among its parts is of fundamental importance to oceanography. Oceanographers divide the ocean into different zones by physical and biological conditions. The pelagic zone includes all open ocean regions, and can be divided into further regions categorized by depth and light abundance. The photic zone includes the oceans from the surface to a depth of 200 m; it is the region where photosynthesis can occur and is, therefore, the most biodiverse. Because plants require photosynthesis, life found deeper than the photic zone must either rely on material sinking from above (see marine snow) or find another energy source. Hydrothermal vents are the primary source of energy in what is known as the aphotic zone (depths exceeding 200 m). The pelagic part of the photic zone is known as the epipelagic. The ocean can be divided into three density zones: the surface zone, the pycnocline, and the deep zone. The surface zone, also called the mixed layer, refers to the uppermost density zone of the ocean. Temperature and salinity are relatively constant with depth in this zone due to currents and wave action. The surface zone contains ocean water that is in contact with the atmosphere and within the photic zone. The surface zone has the ocean's least dense water and represents approximately 2% of the total volume of ocean water. The surface zone usually ranges between depths of 500 feet (150 m) to 3,300 feet (1,000 m) below ocean surface, but this can vary a great deal. In some cases, the surface zone can be entirely non-existent. The surface zone is typically thicker in the tropics than in regions of higher latitude. The transition to colder, denser water is more abrupt in the tropics than in regions of higher latitudes. The pycnocline refers to a zone wherein density substantially increases with depth due primarily to decreases in temperature. The pycnocline effectively separates the lower-density surface zone above from the higher-density deep zone below. The pycnocline represents approximately 18% of the total volume of ocean water. The deep zone refers to the lowermost density zone of the ocean. The deep zone usually begins at depths below 3,300 feet (1,000 m) in mid-latitudes. The deep zone undergoes negligible changes in water density with depth. The deep zone represents approximately 80% of the total volume of ocean water. The deep zone contains relatively colder and stable water. If a zone undergoes dramatic changes in temperature with depth, it contains a thermocline. The tropical thermocline is typically deeper than the thermocline at higher latitudes. Polar waters, which receive relatively little solar energy, are not stratified by temperature and generally lack a thermocline because surface water at polar latitudes are nearly as cold as water at greater depths. Below the thermocline, water is very cold, ranging from −1 °C to 3 °C. Because this deep and cold layer contains the bulk of ocean water, the average temperature of the world ocean is 3.9 °C. If a zone undergoes dramatic changes in salinity with depth, it contains a halocline. If a zone undergoes a strong, vertical chemistry gradient with depth, it contains a chemocline. The halocline often coincides with the thermocline, and the combination produces a pronounced pycnocline. This website is provided on a free basis as a public information service. copyright © Cleaner Oceans Foundation Ltd (COFL) (Company No: 4674774) 2018. Solar Studios, BN271RF, United Kingdom. COFL is a charity without share capital. The names Amphimax™ and SeaVax™ are trademarks.